I’m trying to place an Infusionsoft web form that has radio buttons on it on to an OP2 landing page. Every time I try it the radio buttons never show up. Is there a way to do this? I would REALLY appreciate your feedback. Wish I could help but I don’t use Infusionsoft myself so I don’t know how it works. Have you checked with OP Support? As far as I know, they’re using Infusionsoft. Hi KM, thank you so much for your sharing. 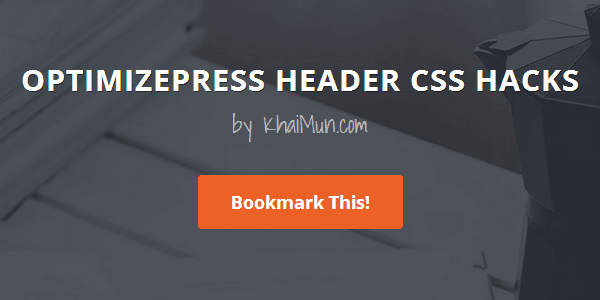 I’m a beginner to creating website with OP2, I hope you would give me some help on the CSS code for transparent header color. To have a ‘transparent’ header, all you need is leave the header background colour option blank (for Header Style → Logo With Alongside Navigation). I’m trying to reduce the size of the navigation bar with the code you provided, but it’s not working. After I save, it stays the same. BDW nice work! Are you using it for the Blog? The code here is for pages built with the LiveEditor. The code for the Blog is slightly different. Please refer to this tutorial. Come on man, this is super useful but you disabled copying and pasting and rightclicking on the web and I’m way too lazy for that. How am I supposed to type all this out man? How do I make the menu like your Awesome template? The menu changes from transparent to background color and shrinks when scrolling down. Can you help me with my blog page – header padding? On my LiveEditor pages it looks good – but on my actual Blog post pages the padding is huge and I can’t seem to find the CSS that reduces it to look like the home page. P.S. I noticed you’re using the ELITE sales template on your site. If you’ve some spare time, appreciate if you could leave a review in the marketplace here (click Reviews) or a quick-shout out at FB. It’ll help me a bit in terms of social proof and getting future buyers. Absolutely! I love your work and I love OP. I am struggling to create a logo which is 200 x 50. I have created a logo in photoshop at 500 x 500 but when resizing to make it smaller the logo becomes pixelated. I have looked everywhere but what ever I do it doesn’t work. Right now I was trying to do a smaller version of it but it still looks funny. Maybe I am approaching it wrong. Could you please give me some pointers how or where to get tutorials on creating a 200×50 logo. Thanks for this! Question — in your example you show a solid call to action button in the navigation. I added the code (modified a bit) on this page for the Programs link. I was hoping it could be a solid color “button” instead of just an outline. Any help is appreciated!